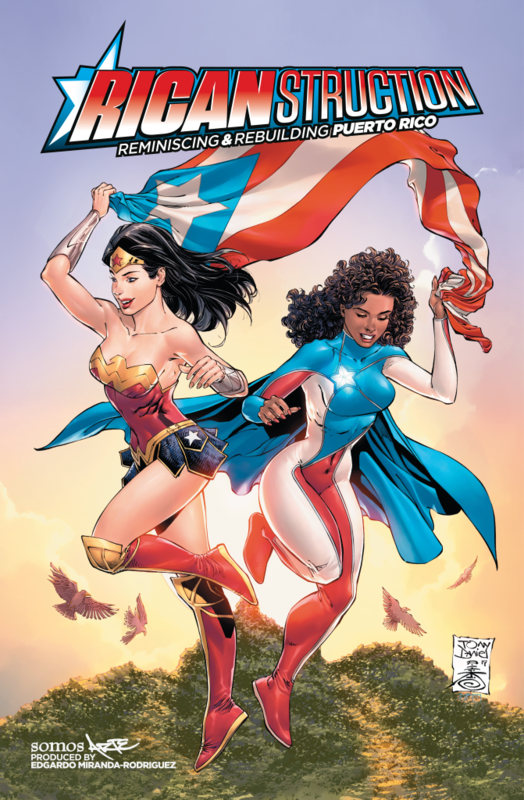 Edgardo Miranda-Rodriguez celebrates the spirit of Puerto Rico and the need that exists on the island in Ricanstruction: Reminiscing & Rebuilding Puerto Rico [Somos; $19.99]. Working with his super-hero creation La Borinquena, an impressive roster of comics writers and artists, and DC Comics’ generous use of some of its legendary super-heroes, Miranda-Rodriguez has put together an anthology that is remarkable in its purpose and its quality. La Borinquena is a terrific creation. The environmentally-powered super-hero represents the courage, the drive and the spirituality that is key to Puerto Rico. The short stories and other artwork include comics super-stars and lesser (but not less talented) creators. That list includes Frank Miller, Gail Simone, Tony Daniel, Greg Pak, Reginald Hudlin, Denys Cowan, Ken Lashley, Bill Sienkiewicz, Tara Strong and others. The anthology contributors even include celebrities like Rosaro Dawson, Ruben Blades, Kirk Acevedo and more. La Borinquena has some powerful super-friends helping her in this great undertaking: Wonder Woman, Superman, Batman, Aquaman, Flash, Supergirl, Harley Quinn, Green Lantern, Static, Icon, Swamp Thing and more. Every story is a delight in one way or another. Despite the grimness of the situation, these are stories about good people pulling together in the cause of light. I love Ricanstruction and recommend it to one and all. One hundred percent of the proceeds from this book go to the efforts in Puerto Rico. You’ll be doing good by buying this great comic book. And, if you would, please consider donating to the organizations continuing the work our government left unfinished. The Simpsons is the most popular animated show in U.S. history and the longest running scripted American TV series period. 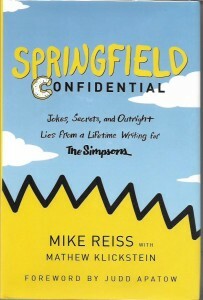 Springfield Confidential: Jokes, Secrets, and Outright Lies from a Lifetime Writing for The Simpsons by Mike Reiss with Mathew Klickstein [Dey Street Books; $27.99] is a sure contender for its claim of being “the ultimate fan guide” to the show, but it’s also the story of a writer’s life. Reiss is the longest-serving writer and producer of The Simpsons. He still contributes to the show, flying in from New York City once a week. He’s written for movies and other TV shows. He’s written children’s books. One of those kids’ books – The Boy Who Looked Like Lincoln – was met with considerable and ridiculous criticism. Naturally, I’m hoping to read it soon. As a writer, I’m fascinated by the autobiographical parts of this book and the detailed descriptions of how episodes of The Simpsons are conceived, birthed and nurtured on their way to my TV screen. The trivia alone would make Simpsons Confidential a must-have book for Simpsons fans. Throw in globe-trotting to the unexpected lands where The Simpsons is a hit (and one place where it is not) and the “ultimate fan guide” doesn’t seem far off at all. The book has a forward by Judd Apatow as well as interviews with Apatow, Conan O’Brien, Al Jean, Nancy Cartwright, Dan Castellaneta and others. It doesn’t diminish the magic of the show; it enhances it. If you’re a casual or even a lapsed viewer of The Simpsons, you will enjoy this book. Simpsons Confidential would make a terrific gift for Simpsons fans and for those interested in the behind-the-scenes creation of that and other shows. It should definitely have a place in your more hip public and school libraries. I recommend it highly. 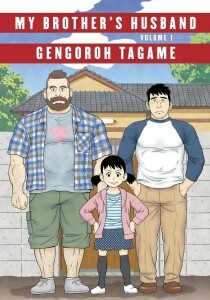 My pick of the week is My Brother’s Husband Volume One by Gengoroh Tagame [Pantheon; $24.95]. Work-at-home divorced dad Yaichi raises his daughter Kana in suburban Tokyo. Yaichi’s gay twin brother Ryoji, who left Japan and moved to Canada, has passed. A knock on Yaichi and Kana’s door changes their lives. Canadian Mike Flanagan was married to Ryoji and has come to Japan to connect with his late husband’s country and family. Yaichi has some difficulty wrapping his head around the presence of his twin’s husband entering their lives, but invites him to stay with him and Kana. The young girl is over the moon with joy at meeting her new uncle and the two bond quickly. This frankly beautiful story of acceptance, love and respect does not shy away from the prejudice gay people face, a prejudice that is quietly magnified in Yaichi’s conservative world. Yaichi makes the effort to overcome his prejudice, but is still deeply concerned when the parents of some of Kana’s friends don’t want them to play with her because of Mike and even more so when Kana asks her father if girls can marry other girls the same way Mike and Ryoji married. Tagame is an openly gay comics creator, so there’s an authenticity to the story. His stories and art have been published and displayed all over the world. I’m looking forward to see more of his comics. My Brother’s Keeper is an all-ages title, but, as with any comics, parents should make their own decisions as to whether or not this series is suitable for their children. They don’t get to make that decision for other people’s children and I would urge them to look at this manga with open eyes. It is a brilliant work that has won a 2018 Eisner Award and the Japan Media Arts Award for Outstanding Work of Manga from the Agency of Cultural Affairs. This is another comics work that should be read by anyone who loves great comics. It belongs in public and school libraries, though it will doubtless be challenged by some. Great comics art, like great art period, makes us think. Closed minds will never be conducive to that process.